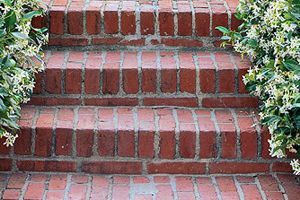 Comment: brick steps are sinking. porch and steps mortar needs replacing. Comment: Creating a walking path through our woods. 30-50 stepping stones. Comment: Need to repair brick wall where piping perforations came through from previous use. Comment: We need to drill weep holes in retaining wall today/tomorrow to run off the water accumulation behind the wall. Comment: I have approximately a 30X30 area that I want paver's laid. a cross tie wall built with steps. Comment: This is a brick front porch with 5 steps (5' 3" wide) up to a landing (sixth step). Planning on 13'7" wide by 5' length for the landing. Because of the landing height (3.5'), will need rod iron railings around the landing and down the steps. Assertive Tile & Marble, Inc.
Grass Masters & Designs, Inc.
Woodstock Brick & Stone Masonry Contractors are rated 4.79 out of 5 based on 446 reviews of 22 pros. Not Looking for Brick & Stone Contractors in Woodstock, GA?